Children can grow very rich very easily because they have TIME on their side. Time is an investor's greatest ally. It is the key element in the power of compounding, and combined with investments in the stock market (where the average annual return has been nearly 11% since 1926), the results can seem like magic. Compounding at a good rate of return over a long period of time makes it really easy to create millions. Here is another example: A child who invests $50 a month from age eight to age 13 (a total investment of $3,600 over the six years) will end up with more money at age 65 ($1,302,154) than someone who starts investing at age 26 and invests $2,000 EVERY YEAR until he or she retires at that age. Those results are based on an 11% annual return. The challenge is to put together a basket of stocks that will perform as well as, or better than, the stock market as a whole and to do so on a budget. That's not an easy task if you are making your investments through a traditional broker, where you typically buy in 100-share ("round") lots. A representative basket of stocks would likely cost more than most new parents or grandparents would be able to put away for any one child at any one time. What's more, in a brokerage account it's all too easy to buy and sell. After all, they make their money from commissions! Investing through DRIPs is the answer. In 1994, we created the MP 63 DRIP Index. We thought that DRIP stocks by their nature would outperform the market as a whole and we were correct. We publish the DRIP Index at directinvesting.com (click on the link "DRIP Stocks Compared with the Market"). 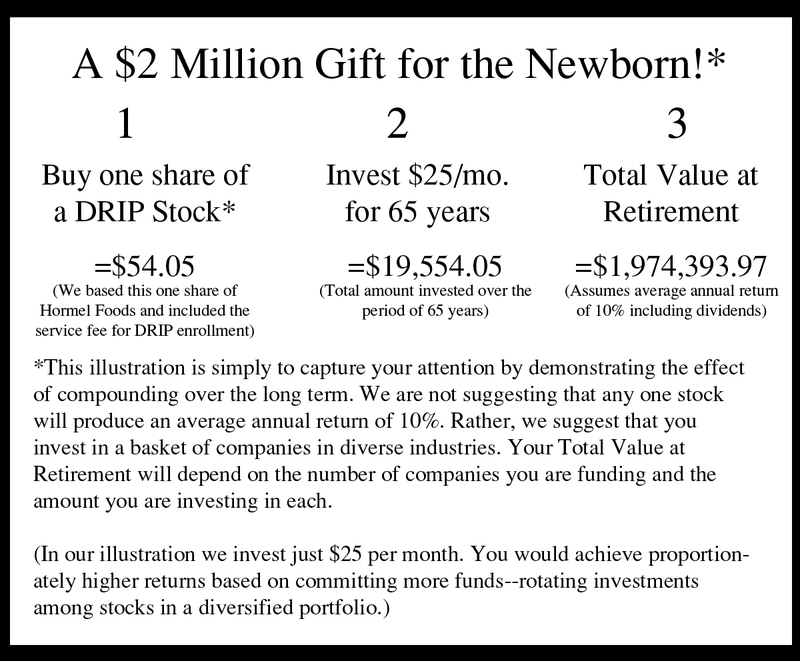 You don't need a lot of money to set up a diversified portfolio of DRIP stocks. You can start with one share of each company and make small investments to buy additional shares every month (or every quarter). By accumulating shares in this manner, you don't need to SPECULATE about the right time to invest. That's because your small regular investments will end up buying fewer shares when prices are high and more shares when they are low. Your net cost will be less than the average cost of the shares during the period. Investing in this manner is called dollar-cost averaging, a strategy that "forces" you to buy low. Most people associate investing with a brokerage account (and buying round lots). If you were to make small, regular investments in a diversified portfolio of companies through a broker, commissions might account for more of the investment than would the stock itself. Which companies should you select? Here is a 20-stock DRIP portfolio made up of stocks we like for long-term accumulation. I've marked with an asterisk those that are particularly appropriate for the prospective millionaire. Those DRIPs accept small amounts, such as $25 or even $10--and do not charge service fees for investing or reinvesting--or only tiny ones. The other 10 stocks in this month's portfolio are also among our favorites for long-term accumulation, but may charge fees for investing or require larger investments amounts. You (or your child) can easily open an account in these DRIPs at www.directinvesting.com, where you will be charged a one-time only enrollment fee. After you are enrolled, you would send your investments directly to your own account on the company books.